Building the world’s first commercial land-based coral farm. They are building the world's first commercial, land-based coral farm, to restore our planet's dying coral reefs. The world has already lost half of all coral reefs, making Halpern's mission more urgent than ever. "Last month was crazy, with the team attending a range of conferences and events. Coral Vita won the Ocean Exchange pitch competition, and we were part of a team that won the XPrize Visioneering competition--there will now be an XPrize on reef restoration," said Halpern. He also attended a fellowship convening in San Francisco for the JM Kaplan Innovation Prize and the Echoing Green fellowship, and went to the Our Ocean Conference--a political ocean summit in Bali. 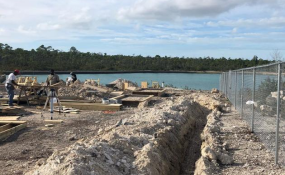 "While all the events were ongoing, things moved along in Bahamas, where we are building our coral farm. We received our final building permits, moved ahead on contracting work to build the farm, and permits needed to complete our aquaculture work. "One of the challenges we face going forward is balancing internal needs to move ahead on things like construction and farming, while also making time to progress in our business development. "Making external connections is really essential for our business, but can be time consuming, and striking a balance between this and other internal needs will be important for us in 2019." "Why not check out our website and adopt a coral this year? We're really excited about 2019, and hope you'll stay tuned to join us for the ride!"